Campatible with all kinds of digital cameras and camcorder weights below 2.5KG. 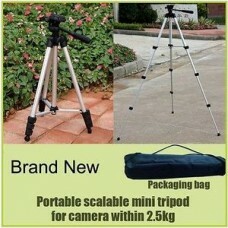 It is a 3 way head tripod, supports either horizontal or vertical camera position. Convenient quick-release plate with 1/4"-20 connection thread. Adjustable height from 1.1ft(34.5cm)to 3.4ft(102cm). Made of light weight aluminium.